When Nathan and I started dating, one of the things that struck me most quickly, well, you know besides being totally twitterpated (we’re talking Bambi, not social media) was how different our taste in food was. Nathan grew up on meatloaf, I grew up on grain burgers (barf, by the way . . . you really dropped the ball on that one, mom). Where Nathan had potato salad, I had tabbouleh. You get the idea. But it wasn’t just our tastes in regular meal food, it went to desserts too! Nathan is a huge ice cream fan, and I think it’s just okay (I’m actually kind of cringing at the thought of what he is going to say when he reads the words “just okay”). So when I made these Cinnamon Roll Cheesecake Cookies and Nathan tried one . . and then liked them (!!!) . . . like reeeeeeeeeeeeaaally liked them . . . I felt like a total rock star. I especially felt like a rock star because they are ridiculously simple to make, so simple in fact, that the pictures have been on my computer for months because I was mildly embarrassed to share them with the blogging world. I wasn’t sure if the flavors of Cinnamon Roll (a Duncan Hines flavor packet) and Cheesecake (a pudding flavor) would mesh well, but they are so good. Especially with the white chocolate thrown in. If you haven’t put pudding mix in your baked goods yet, run out to the store and by a box (or seventeen). You just use the dry mix and it makes everything that much more flavorful and moist. Finding a flavor of anything that Nathan and I both love? Win. UPDATE: Duncan Hines discontinued their flavor packets so the recipe has been updated to reflect a substitution. Happy baking! Preheat your oven according to the directions on the cookie mix. Combine all of your ingredients. 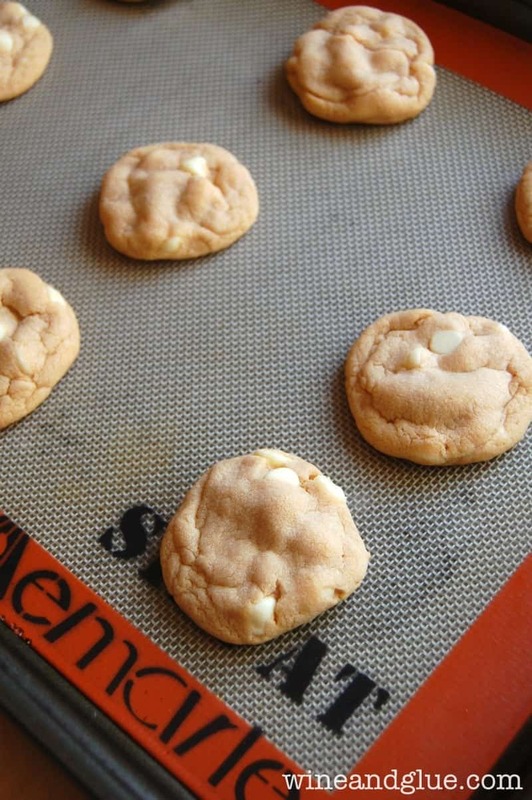 Make one inch sized balls out of the cookie mix and space an two inches apart on parchment paper or a silicone mat . Bake according to the instructions on the cookie package or until the cookies begin to turn golden at the edges. It took my cookies about 15 minutes. Your recipes all sound so addictive! I could eat a batch of these cookies for breakfast right now. Your mom dropping the ball — that comment cracked me up. I’ll be smiling all day over that one. Wait, they still make Code Red??!!! This is a GENIUS recipe. I love the idea of the Frosting Creation AND pudding!!!! SOOOOOOO trying! Right?? The possibilities are endless! Holy cow those look amazing! Definitely pinning these, cuz there are my type of quick and easy cookies! Jessi @ Practically Functional recently posted…Small Apartment Solutions: Closet Organization! Oh my, these looks sooo yummy…cinnamon…I am there! These cookies look yummy, unique AND easy. So, sign me up! And, just so we’re clear….I ALSO married a 15 year old boy – loves Star Wars, Back to the Future, hates onions, grew up on Hamburger Helper (and I swear would still eat it to this day if I let it in this house), the list goes on and on. But my question for you my dear….what is a CODE RED? Is that a soda? Never heard of it – but my boy grew up on Moxie and it’s a soda that is over the top dis-gust-ing – think cough syrup. Only on the coast of Maine! Gross! Um, YEAH, these cookies are a super mega win in my book. Then again, anything “cookie” or “cinnamon roll” is a super mega win period. Have I told you how much I love you lately?? These looooook devine! Yum! I would love for you to share and link up at my weekly TGIF Link Party if you haven’t already this week. Your favorite posts, most popular, recent or new! The party is open every Thursday night and closes Wednesday’s at midnight. Followed by (Not SO) Wordless Wednesday! http://apeekintomyparadise.blogspot.com/. Oh my stars. These look so good, I can’t even stand it. I want one NOW! What a genius recipe!!! Lisa, I LOVE cake mix cookies – so easy and these look divine! Oh man, your cookies look wonderful!!! These look AMAZING and I might actually make them because they seem so easy. My husbands going to be so happy. These sounds awesome! I love the cinnamon roll AND cheesecake flavor – genius! is the sugar cookie mix….a box or pouch? size? or maybe it doesn’t matter? It is the pouch, but I don’t know that it really matters. Even if the amounts are a little off (like a box that is an ounce or two more than a pouch) in this recipe, you are really just doctoring up cookies that would cook well on their own. So you should be good! I am also unsure what size sugar cookie pouch to get, I feel like there is a bigger bag or a smaller one. ;/ Do you happen to have any idea on how big it might be? 🙂 Thank you. It was 17 something ounce. I baked these tonight, and I have to say that they were AMAZING!! I will definitely be making them again soon! Thanks so much for the recipe! That’s so great to hear, Leslie! I love hearing when recipes turned out well!! Hope this isn’t a silly question, but the pudding mix – I’ve never seen/heard of cheesecake flavor. Is it cook/no cook and what is the brand? Not a silly question at all Patricia! It’s Jello brand, and I found it right in my grocery store with all the other flavors. I actually hadn’t heard of it either until I went looking for a fun flavor to make pudding cookies with! Good luck! I have no idea what I did wrong but my cookies turned out flat and not right! This might be a silly question but along with the sugar cookie package ingredients, the pudding mix calls for 2 cups of milk; am I also adding this in? I am so sorry it didn’t work out for you Linda! I assume that you did add the other ingredients for the cookie dough? Mine called for butter and an egg. And no, you don’t add the milk for the pudding. I can see why these are the cookies that won’t quit!! Super easy plus pudding cookies plus delicious!!!!! I can forgive your ice cream ambivalence because these look so super awesome. So funny how you and your husband are on opposite ends of the food spectrum. I’m fortunate to live with a guy that will pretty much eat whatever I give him. He’ll be happy to have these cookies! I have never heard of this Duncan Hines flavor creations, is it a cake mix or what??? These look Amazing, thanks!! roughly how many cookies does one batch make? Great question, Nicole. I would say roughly two dozen. But it greatly depends on how big you make them. I made these cookies today and it was a bad idea. They are too yummy and hubby won’t eat them so they must leave the house. I will be taking them to the office tomorrow. To bad for the ladies that planned to start their diet timorrow. Kimm, you scared me! I thought that they didn’t turn out well! Glad to know they came out just as addictive and rich as always! 🙂 Yes, get them out of the house. Fast! looks soooo yummii!! 🙂 please could you precise the exact mesures?! these sugar mix package and cinamon flavor are not available in my country ! thanx a lot ! Thanks! I’m really sorry, for this particular recipe I can’t give the precise measurements. I just happened to use some handy store bought products to make it. I made these last nite. They were great! Hubby loved them and will definitely make again. Any more recipes like this? Made these cookies for a church function…. They were a huge success! I would have never thought to put pudding mix with cookie dough. Adding those flavor packets!? So good!! I decided to play around with flavor combos and made a chocolate toffee caramel cookie. Same idea, only I used the chocolate pudding, caramel flavoring, and added toffee bits in with chocolate chips. They are rich, but delicious! Thank you SO much for this recipe!! Candice, first, thank you so much. Hearing that people have tried one of my recipes and liked it makes me happier than you could know. Second, I might have to blog that recipe (with full credit to your genius of course), it sounds amazing!! These cookies sounds amaZing and really easy to make. I’m always looking for new recipes for our family cookie exchange. Do you know how many cookies one batch makes? Thanks! Kim, I made them so long ago! 🙂 My memory is about two dozen. I have been looking for a cookie to take to the annual cookie exchange – this just may be the one. Easy to make and they sound AMAZING! Thank you. I would love to make these cookies! I’m obsessed with cookies and always bring cookies on trips or tailgates. I love experimenting with new cookies! Could you tell me what the cinnamon roll flavor creation is by Duncan hines. I’m unsure of what that is? Hi Katie! 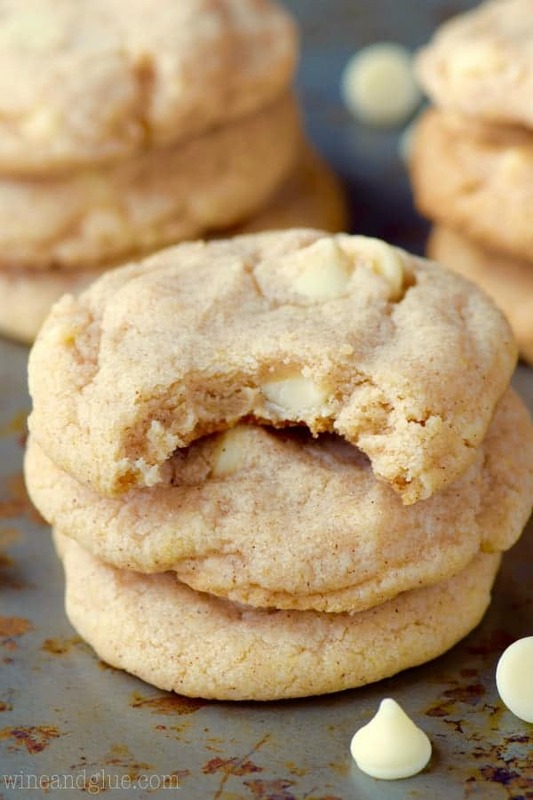 I actually just added a note to the recipe from a reader who couldn’t find the flavor creations and subbed with brown sugar and cinnamon with great results. Check it out! I can only find the sugar-free cheesecake pudding (after 3 stores). Can I use this and then just add sugar? Crisis Averted! My husband went on Amazon and ordered the cheesecake pudding mix! Sometimes he can be awesome! HAHA! I’m going to make them right now!! Has anyone used chocolate chips? Craisins? I’m kinda obsessed with those little beauties. I might have to split the batch up and try some of each! Hi. How many cookies does this recipe make? I made these cookies and took them to the office, BIG HIT. Wonderful recipe. I’m so glad you liked them Karen! Do you make the sugar cookies per the package then add the remaining ingredients? Hi Kathie! Yup! 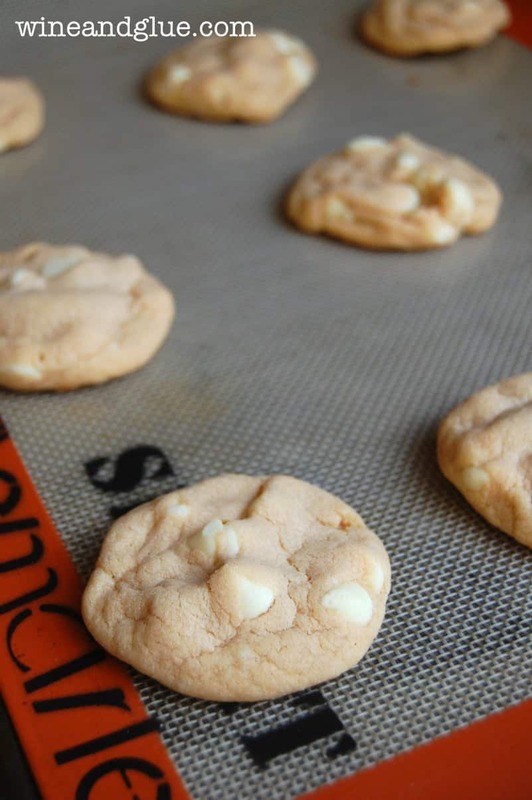 You can just add the extra dry ingredients to the dry powder mix and then make it as the package suggests and stir in the white chocolate chips. These sound wonderful. I have a card party tomorrow and these sound like a good fit. I wanted to sure of the size of pudding, 3 or 5 ounce? I just found this recipe on Pinterest. I am going to make them for my grand girls for Easter. They look and sound like they are wonderful and yummy. Thanks for sharing. For the past few months, I’ve been looking for the JELL-O CeeseCake flavored pudding mix but I couldn’t ever find it but I will always seen the Sugar-Free flavored one. Well yesterday while at Walmart, I finally found it! Today I made this recipe and it turned out great. The first batch was in the oven for 12-13 minutes and those cooled to a hard crunchy cookie. Still good though because they will still get eaten by me lol. The other batches were in the oven for 10 minutes and afterwards, they cooled on the sheet they were baked on for a few more minutes. If anyone had problems finding the the sugar cookie mix to use, I used the Betty Crocker sugar cookie mix sized 17.5 ounce. These cookies are delicious. I will be making these again. Thank you!! So glad you liked them, Ashley! Ola, you have to try these to recipes! These Perfect Sugar Cookies and these Red Velvet Sugar Cookies with Cream Cheese Frosting! Your recipe never called out what size box of pubbing? Please can you kindly specify? I love your cookie recipe. You know, Becky, I go back and forth! I hate washing silpats, but I do love how well they work and it feels less wasteful . . . though I suppose washing them is water waste too, lol! Gah! And thank you. I’ve tried making these several times. They don’t spread and they are so hard you could break a tooth if you’re not careful. I use the size and brand of cookie mix shown in the video and the 1 stick of butter and 1 egg called for on the package. I only bake them for 9 or 10 minutes. What am I doing wrong? The flavor is wonderful, that’s why I keep trying. Please help! Oh Jan, I’m so sorry! That is so frustrating. Honestly, I’m super perplexed by this because this is quite literally the easiest baking recipe on my blog. The only thing I can think of is making sure that your oven temperature is not off (though I would guess it isn’t because other things would be burning). Are you baking at high altitude? This is my kind of recipe! I’m more of a cook than a baker, so when I bake, I like it to be quick and simple. I also find it fun to take a convenience product and make it into something else. These looks perfect! Can’t wait to serve them up to my kids. Yea… to my kids… yea that’s who I’m making them for .